On the field of battle, cavalry are one of the most effective units a Commander can deploy. They are highly mobile, able to hit hard, and are fairly resilient (even for lightly armored units). One of the best defenses against them, however, are pikemen. With their long spears, halberds, or pikes, they can stop a cavalry charge dead in its tracks before any real damage is done. This month’s releases for the A Song of Ice and Fire: Tabletop Miniatures Game includes both a unit of cavalry and a unit of pikemen. These two opposing forces are sure to make an impact in any battle they are fielded. Starting off with the cavalry, House Stark are getting a unit of Stark Outriders. Highly mobile, but lightly armored, the Outriders are adept at scouting out enemy positions, attacking from unknown quadrants, and then making an escape. In fact, after making a melee attack, Stark Outriders are able to make a free Retreat action. Due to their high rate of speed, they can easily outreach enemies who might be looking to deal a counter-attack to them. Instead, the enemy is left bloodied and with nobody around on whom they can take out their aggressions. Savvy Commanders will find them a highly adaptable unit, able to take objectives, but might not be the best at holding them. But if an attack is required from any quarter, they’re a go-to for that mission. On the other side of the field, there are the Lannister Halberdiers. The Lannisters are well-known for being rich, and they spend lavishly on their forces. Even their Halberdiers, a unit that is usually neglected in other armies, owing to the relative cheapness of their kit, are equipped with the best. Their halberds have been reinforced, making sure that almost nothing will break them. They also are given sturdy armor. The Lannister Halberdiers are a rock upon which enemy forces will break upon like a wave. With the reach afforded by their halberds, the unit doesn’t lose attack dice for losing their first rank of troops. They can also brace for impact, getting a free attack against enemies that declare a Charge against them. Finally, the Halberdiers box includes an Assault Veteran Unit Attachment. They can grant extra attack dice to units they are fielded in, adding an extra offensive component. For a unit with already solid melee abilities, the Assault Veteran can push them over the top. In combat, it’s an arms race to come out with a victory. Cavalry are one of the best units in terms of speed, maneuverability, and offensive power. To counter them, men armed with halberds are fielded. This continues on, as both sides try and overcome the defenses of the other. 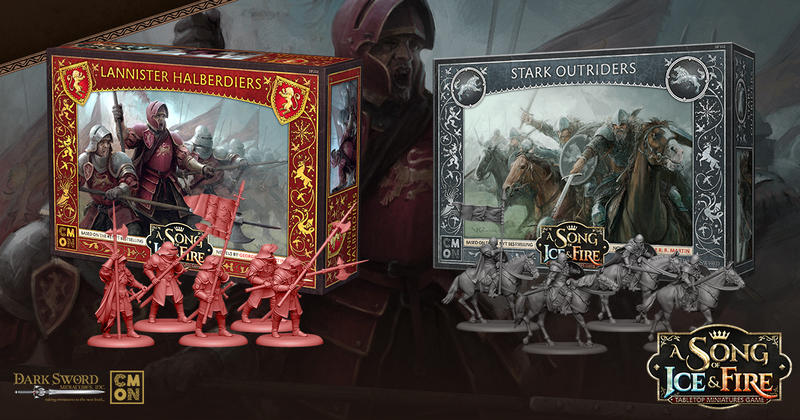 On November 23, Stark and Lannister Commanders will have new units to aid them in this arms race to the Iron Throne. Visit the official A Song of Ice and Fire: Tabletop Miniatures Game site here.